A bewildering variety of colourful and spicy fruits make Capsicum peppers instantly recognisable to both gardeners and chefs. Originally from South and Central America, their popularity continues to grow across the world due to their ease of cultivation, frequently sharp taste and attractive appearance. Alt. 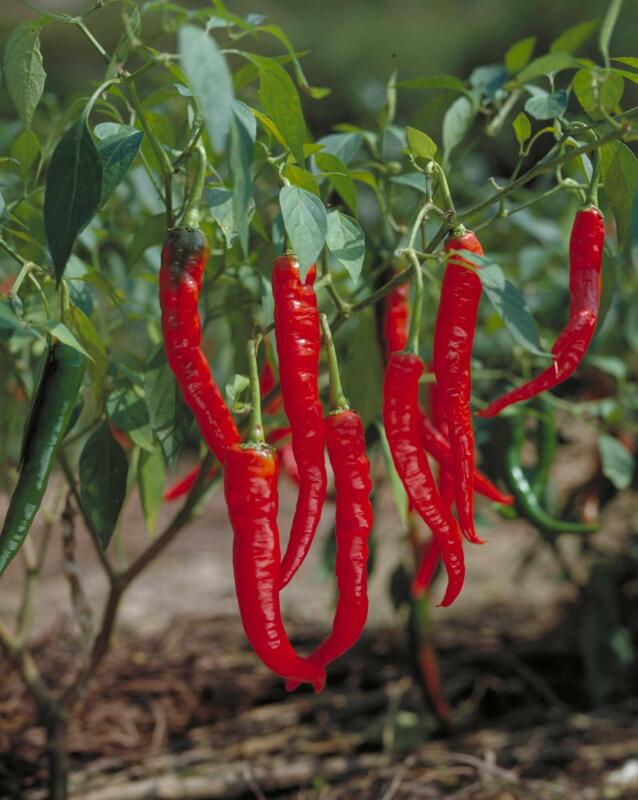 5 - 1700 m.
This species includes a wide variety of peppers, including chilli peppers used in curries and sweet bell peppers used in salads. There are more than 200 common names in use for this species. 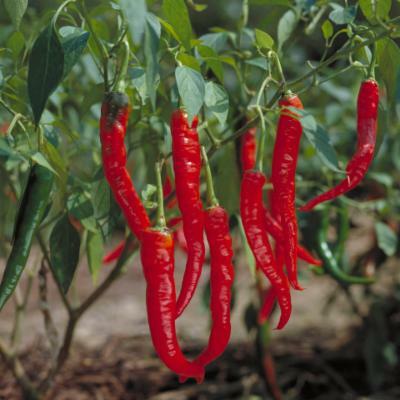 The most common include chilli pepper, paprika (sweet varieties); bell pepper, cayenne, halapenos, chitlepin (hot varieties); and Christmas peppers (ornamental). Capsicum annuum should not be confused with 'black pepper', Piper nigrum, which belongs to a distantly related plant family (Piperaceae). 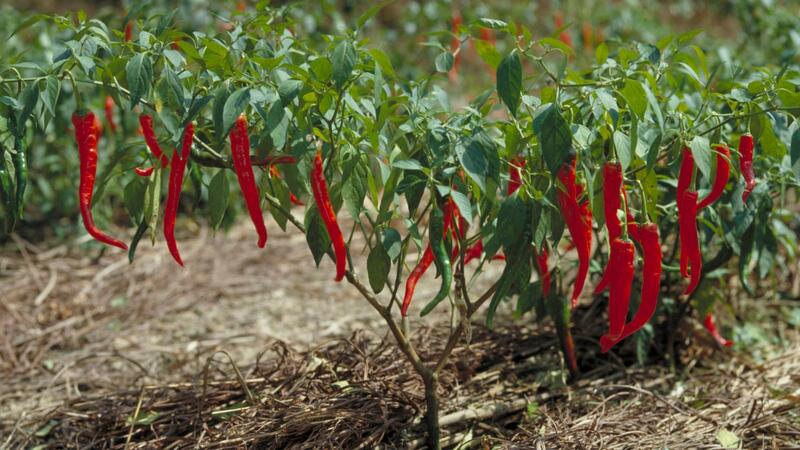 Wild ancestors of Capsicum annuum evolved in Bolivia and southern Brazil, probably long before human habitation. Archaeological research estimates that they were first domesticated at least 6,100 years ago. Numerous varieties were known to the Aztecs in Mexico before the Spanish arrived. 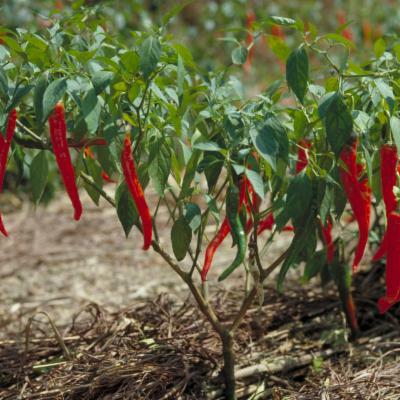 Christopher Columbus brought seeds to Europe, and Capsicum annuum began to be planted extensively in Portuguese colonies in Africa, India and Asia. It is now grown around the world, both commercially and domestically. An attractive, upright shrub usually less than 1 m tall, with small, white, pendent flowers and elongated, yellow, orange or red fruits (berries). It can be distinguished from other types of domesticated peppers by flowers that are solitary rather than in groups, and filaments (thread-like stalks supporting the anther) that are not purple. Capsicum annuum can be difficult to separate from the cultivated C. chinense (the hottest pepper) and C. frutescens (Tabasco pepper) and their morphological features can overlap. These three species share the same ancestral gene pool and are sometimes called the 'annuum-chinense-frutescens complex'. The varieties and cultivars of Capsicum annuum are classified on the basis of their fruit shapes. There are so many different kinds (several thousand) that nobody knows exactly how many there are. More and more local variants are appearing in cultivation across the world because existing varieties cross-pollinate easily. Capsicum fruits have been part of the human diet for at least 10,000 years. The fruits of non-pungent (sweet) varieties are eaten raw in salads or cooked as a vegetable. They are rich sources of vitamin C (ascorbic acid) and vitamin A.
Pungent types, including chillies, are used as a condiment or spice for seasoning. The dried fruits are ground to a powder (paprika) and used as an ingredient in curry powder. The pungency is mainly due to the presence of chemical compounds called capsaicinoids, which deter most mammals from eating the fruit. Birds, however, will eat them without harm (and indeed help to disperse the seeds). Pepper extracts are used to flavour ginger beer, and are used in pharmaceutical products for treating conditions such as athlete's foot and arthritis. Maya Indians used pepper spray as a weapon against their enemies, and today some police forces around the world use it to control unruly individuals. Ornamental varieties of Capsicum annuum (the fruits of which are also edible) are grown primarily for the decorative value of their fruit, often displaying fruits of four or five colours simultaneously on one plant. The popular 'Christmas peppers' were originally available at Christmas time and had green and red fruits. How hot is a 'chilli'? In 1912, a pharmacist named Scoville developed an index for measuring the pungency of peppers. Scoville Heat Units (SHU) are still used today and measure by how much a chilli extract has to be diluted in sugar syrup before its heat becomes undetectable to a panel of expert tasters. Sweet (or bell) peppers rank at 0 SHU, while New Mexico green chillies are mildly pungent at 1,500 SHU. The 'hottest' of the world's chillies exceed 80,000 SHU, but even they are relatively mild compared to the hottest of them all (the 'infinity chilli'), which registers over 1,000,000 SHU. Imagine that next time you have a curry! The Millennium Seed Bank Partnership aims to save plant life worldwide, focusing on plants under threat and those of most use in the future. Seeds are dried, packaged and stored at a sub-zero temperature in our seed bank vault. There are two collections of Capsicum annuum seeds stored in Kew's Millennium Seed Bank based at Wakehurst in West Sussex. 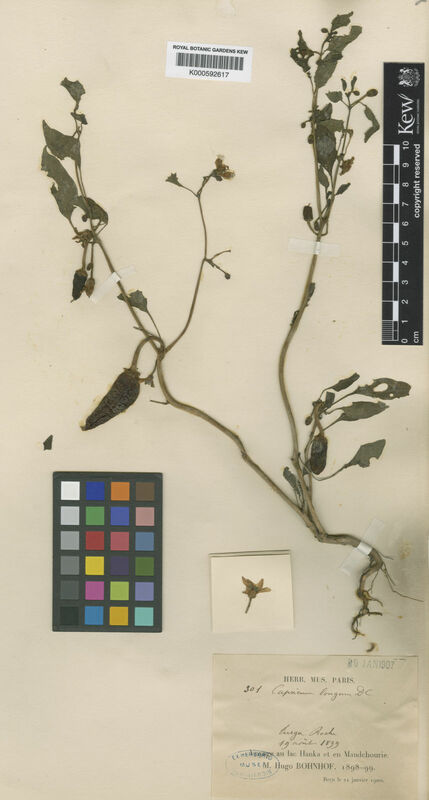 Specimens of the fruits and seeds of Capsicum annuum are held in Kew's Economic Botany Collection in the Sir Joseph Banks Building and are available to researchers by appointment. Tropical deciduous forest. Widely cultivated. Widespread; Least Concern (LC) according to IUCN Red List criteria. Juice (of the fruit) can cause dermatitis; avoid contact with eyes. Nativa y cultivada en Colombia; Alt. 5 - 1700 m.; Amazonia, Andes, Guayana y Serranía de La Macarena, Islas Caribeñas, Llanura del Caribe, Orinoquia, Pacífico, Valle del Magdalena. Shrubby herb or small shrub, to 1.5 m, often short-lived. Crop wild relatives which may possess beneficial traits of value in breeding programmes (State of the World's Plants 2016). Used as a condiment (Pérez Arbeláez 1996). Used in gums, resins and oleoresins (Rugeles Chacón et al. 2012). Materials (State of the World's Plants 2016). Capsicum annuum var. acuminatum Fingerh. Capsicum annuum var. grossum (Willd.) Sendtn. Capsicum annuum var. longum (DC.) Sendtn. Capsicum conoideum var. chordale Fingerh. Capsicum conoideum var. sulcatum Fingerh. Capsicum cydoniforme Roem. & Schult. Capsicum indicum var. aviculare Dierb. 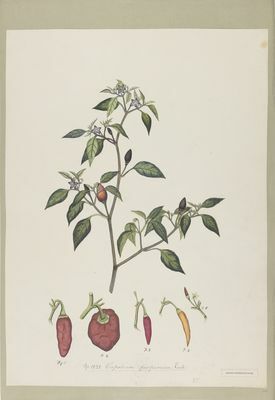 Capsicum pomiferum Mart. ex Steud. Capsicum purpureum Vahl ex Hornem. Capsicum quitense Willd. ex Roem. & Schult. Capsicum tomatiforme Fingerh. ex Steud. Pimiento, chiplín, pimentón, ají-pique, ají, kutupí, ají pimienta. Bernal, R., Gradstein, R.S. & Celis, M. (eds.) (2016). Catálogo de plantas y líquenes de Colombia 1-2: 1-3068. Libro impreso. Hammel, B.E., Grayum, M.H., Herrera, C. & Zamora, N. (eds.) (2015). Manual de Plantas de Costa Rica. Volumen VIII. Dicotyledóneas (Sabiaceae-Zygophyllaceae) Monographs in Systematic Botany from the Missouri Botanical Garden 131: 1-657. Missouri Botanical Garden. Hul, S. & Dy Phon, P. (2014). Flore du Cambodge du Laos et du Viêt-Nam 35: 1-93. Muséum National d'Histoire Naturelle, Paris. Pérez-Farrera, M.Á., Martínez-Camilo, R., Martínez-Meléndez, N., Farrera-Sarmiento, O. & Maza-Villalobos, S. (2012). Listado florístico del Cerro Quetzal (Polígono III) de la reserva de la biosfera El Triunfo, Chiapas, México Botanical Sciences 90: 113-142. Edmonds, J. (2012). Flora of Tropical East Africa Solanaceae: 1-239. López Patiño, E.J., Szeszko, D.R., Rascala Pérez, J. & Beltrán Retis, A.S. (2012). The flora of the Tenacingo-Malinalco-Zumpahuacán protected natural area, state of Mexico, Mexico Harvard Papers in Botany 17: 65-167. Singh, A. (2012). Exotic flora of the Chandauli district Uttar Pradesh, India: an overview Indian Journal of Forestry 35: 79-84. Garcia-Mendoza, A.J. & Meave, J.A. (eds.) (2012). Diversidad florística de Oaxaca: de musgos a angiospermas (colecciones y listas de especies), ed. 2: 1-351. Instituto de Biología, Universidad Nacional Autónoma de México. Hohla, M. (2011). Zwei Funde der Kleine Seerose (Nymphaea candida) sowie weitere Beiträge zur Kenntnis der Flora von Oberösterreich Stapfia 95: 141-161. Sarmah, K.K. & Borthakur, S.K. (2009). A checklist of angiospermic plants of Manas national park in Assam, India Pleione 3: 190-200. Newman, M., Ketphanh, S., Svengsuksa, B., Thomas, P., Sengdala, K., Lamxay, V. & Armstrong, K. (2007). A checklist of the vascular plants of Lao PDR: 1-394. Royal Botanic Gardens, Edinburgh. Hedberg, I., Kelbessa, E., Edwards, S., Demissew, S. & Persson, E. (eds.) (2006). Flora of Ethiopia and Eritrea 5: 1-690. The National Herbarium, Addis Ababa University, Ethiopia & The Department of Systematic Botany, Upps. Akoègninou, A., van der Burg, W.J. & van der Maesen, L.J.G. (eds.) (2006). Flore Analytique du Bénin: 1-1034. Backhuys Publishers. Thulin, M. (ed.) (2006). Flora of Somalia 3: 1-626. The Royal Botanic Gardens, Kew. Gonçalves, A.E. (2005). Flora Zambesiaca 8(4): 1-124. Royal Botanic Gardens, Kew. Sita, P. & Moutsambote, J.-M. (2005). Catalogue des plantes vasculaires du Congo, ed. sept. 2005: 1-158. ORSTOM, Centre de Brazzaville. Beaman, J. & Anderson, C. (2004). The plants of Mount Kinabalu 5: 1-609. Natural History Publications (Borneo). Correa A., Mireya D. Galdames, Carmen Correa A., M. D., C. Galdames & M. S. de Stapf (2004). Catálogo de las Plantas Vasculares de Panamá: 1-599. Smithsonian Tropical Research Institute. Kress, W.J. et al. (2003). Checklist of the Trees, Shrubs, Herbs, and Climbers of Myanmar: 1-590. National Museum of Natural History, Washington DC. Khan, M.S. & Mia, C. (2002). Flora of Bangladesh 53: 1-48. Bangladesh National Herbarium, Dhaka. Grierson, A.J.C. & Long, D.G. (2001). Flora of Bhutan 2: 1-1675. Royal Botanic Gardens, Edinburgh. Scott, A.J. (2000). Flore des Mascareignes 128: 1-41. IRD Éditions, MSIRI, RBG-Kew, Paris. Dy Phon, P. (2000). Dictionnaire des plantes utilisées au Cambodge: 1-915. chez l'auteur, Phnom Penh, Cambodia. Abdulina, S.A. (1999). Spisok Sosudistykn Rastenii Kazakhstana: 1-187. Academy of Sciences, Almaty, Kazakhstan. Aedo, C., Tellería, M.T. & Velayos, M. (eds.) (1999). Bases Documentales para la Flora de Guinea Ecuatorial; Plantas vascularis y hongos: 1-414. CSIC, real jardín Botánico, Madrid. Wood, J.R.I. (1997). A handbook of the Yemen Flora: 1-434. Royal Botanic Gardens, Kew. D'Arcy, W.G. & Rakotozafy, A. (1994). 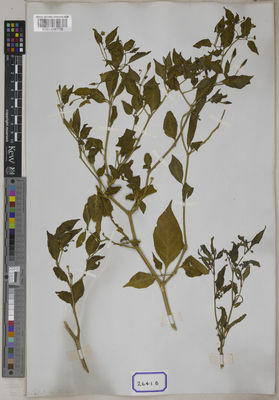 Flore de Madagascar et des Comores (Plantes Vasculaires) 176: 1-146. Typographie Firmin-Didot et Cie., Paris. Audru, J., Cesar, J. & Lebrun, J.-P. (1993). Les Plantes Vasculaires de la République de Djibouti. Flore Illustrée 2(2): 433-968. CIRAD, Départerment d'Elevage et de Médecine vétérinaire, Djibouti. Ghazanfar, S.A. (1992). An Annotated Catalogue of the Vascular Plants of Oman and their Vernacular names Scripta Botanica Belgica 2: 1-153. Smith, A.C. (1991). Flora Vitiensis Nova. A new flora for Fiji (Spermatophytes only) 5: 1-626. Pacific Tropical Botanical Garden, Lawai. Hancock, I.R. & Henderson, C.P. (1988). Flora of the Solomon Islands Research Bulletin Dodo Creek Research Station 7: 1-203. Dassanayake (ed.) (1988). A Revised Handbook to the Flora of Ceylon 6: 1-424. Oxford & IBH Publishing Co. PVT. LTD., New Delhi, Calcutta. Fosberg, F.R. & Sachet, M.-H. (1987). 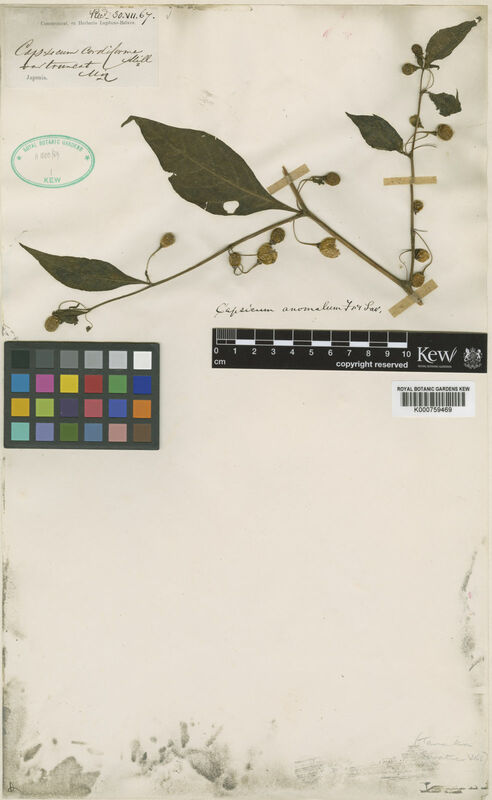 Flora of the Gilbert Island, Kiribati, Checklist Atoll Research Bulletin 295: 1-33. Boudet, G., Lebrun, J.P. & Demange, R. (1986). 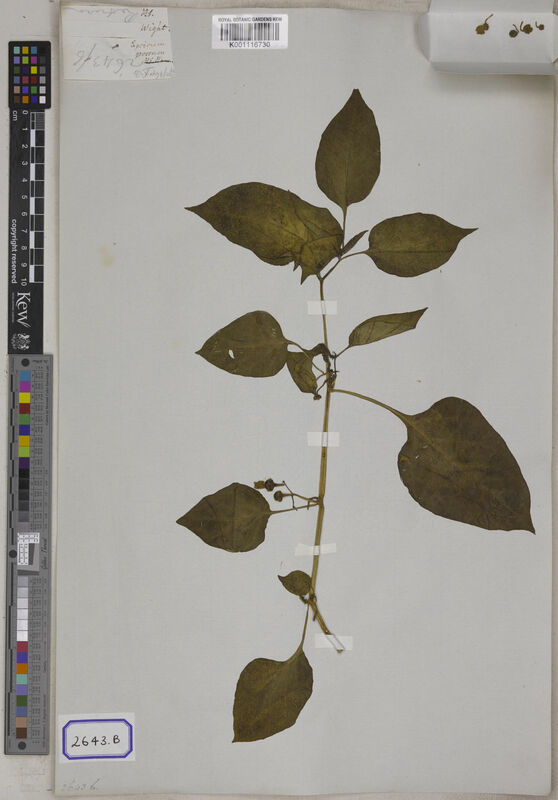 Catalogue des plantes vasculaires du Mali: 1-465. Etudes d'Elevage et de Médecine Vétérinaire des Pays Tropicaux. Nasir, Y.J. (1985). Flora of Pakistan 168: 1-61. Department of Botany, University of Karachi, Karachi. Chukavina, A.P. (ed.) (1984). Flora Tadzhikskoi SSR 7: 1-562. Izd-vo Akademii nauk SSSR, Moskva. Peekel, P.G. (1984). Flora of the Bismarck archipelago for naturalists: 1-638. Office of Forests, Lae, Papua New Guinea. Fosberg, F.R. & Renvoize, S.A. (1980). The Flora of Aldabra and neighbouring islands: 1-358. Crown, London. Davis, P.H. (ed.) (1978). Flora of Turkey and the East Aegean Islands 6: 1-825. Edinburgh University Press, Edinburgh. Boulvert, Y. (1977). Catalogue de la Flore de Centrafrique 2(1): 1-85. ORSTROM, Bangui. Peyre de Fabregues, B. & Lebrun, J.-P. (1976). Catalogue des Plantes Vascularies du Niger: 1-433. Institut d' Elevage et de Médecine Vétérinaire des Pays Tropicaux, Maisons Alfort. Tutin, T.G. & al. (eds.) (1972). Flora Europaea 3: 1-370. Cambridge University Press. Backer, C.A. & Bakhuizen van den Brink, R.C. in Backer, C.A. & Bakhuizen van den Brink, R. C. (1965). Flora of Java 2: 1-641. N.V.P. Noordhoff, Groningen, The Netherlands. Vvedensky, A.I. (ed.) (1961). Flora Uzbekistana 5: 1-667. Izd-va Akademii nauk Uzbekskoi SSR, Tashkent. Hutchinson, J., Dalziel, J.M. & Keay, R.W.J. (1954-1958). Flora of West Tropical Africa, ed. 2, 1: 1-828. Schischkin, B.K. & al. (eds.) (1954). Flora Turkmenii 6: 1-402. Turkmenskoe gosudarstvennoe izd., Ashkhabad. Merrill, E.D. (1923). An enumeration of Philippine flowering plants 3: 1-628. Bureau of Science, Manila. Aguilar-Melendez, A., Morrell, P. L., Roose, M. L. & Kim, Seung-Chul (2009). Genetic diversity and structure in semiwild and domesticated chiles ( Capsicum annuum; Solanaceae) from Mexico. American Journal of Botany 96: 1190-1202. DeWitt, D. & Bosland, P. W. (2009). The Complete Chile Pepper Book: a Gardener's Guide to Choosing, Growing, Preserving and Cooking. Timber Press, Portland. Janick, J. & Paull, R. E. (eds) (2008). The Encyclopedia of Fruit & Nuts. CAB International, Wallingford, Oxfordshire. Vaughan, J. G. & Geissler, C. A. (1999). The New Oxford Book of Food Plants. Oxford University Press, Oxford. DeWitt, D. & Bosland, P.W. (1996). Peppers of the World: an Identification Guide. Ten Speed Press, Berkeley. Rugeles Chacón, L. E., Ortiz, J., Díaz, G., Bladimir, L., & Huertas, D. A. (2012). La cadena de valor de los ingredientes naturales del Biocomercio para las industrias farmacéutica, alimentaria y cosmética-FAC. Universidad de Bogotá Jorge Tadeo Lozano. Pérez-Arbeláez, E. (1996). Plantas útiles de Colombia: edición aumentada, 4a edición. Fondo FEN Colombia. Bothalia 14: 845 (1983). Described from South America. Ann. Missouri Bot. Gard. 60: 591 (1974). Taxon 18: 278, 283 (1969). Purseglove, Trop. Crops, Dicotyl. 2: 525, fig. 84/A (1969). Watt & Breyer-Brandwijk, Med. & Pois. Pl. S. & E. Africa, ed. 2: 942, fig. 234 (1962). Chron. Bot. 17: 108 (1957). J. Williamson, Useful Pl. Nyasaland, ed. 2: 30 (1956). Marloth, Fl. S. Africa 3, 1: 117 (1932). F.T.A. 4, 2: 251 (1906). A. de Candolle, Prodr. 13, 1: 412 (1852). GBIF (2008-continuously updated). Global Biodiversity Information Facility http://www.gbif.org/. Pandey, R.P. & Dilwakar, P.G. (2008). An integrated check-list flora of Andaman and Nicobar islands, India Journal of Economic and Taxonomic Botany 32: 403-500. Catarino, L., Martins, E.S., Diniz, M.A. & Pinto-Basto, M.F. (2006). Check-list da flora vascular do parque natural das Lagos de Cufada (Guiné-Bissau) Garcia de Orta, Série de Botânica 17: 97-141. Gaur, R.D. (1999). Flora of the district of Garhwal north west Himalaya: 1-811. Transmedia, Srinagar, India. Cirilo, N. & Proctor, G.R. (1994). Vascular plants of the Caribbean Swan islands of Honduras Brenesia 41-42: 73-80. Hansen, A. & Sunding, P. (1993). Flora of Macaronesia. Checklist of vascular plants. 4. revised edition Sommerfeltia 17: 1-295. Purdie, R.W., Symon, D.E. & Haegi, L. (1982). Flora of Australia 29: 1-208. Australian Government Publishing Service, Canberra. Correll, D.S. & Correll, H.B. (1982). Flora of the Bahama Archipelago: 1-1692. J.Cramer, Vaduz. Fosberg, F.R. (1975). Vascular plants of Aitutaki Atoll Research Bulletin 190: 73-84. Lebrun, J.-P., Audru, J., Gaston, A. & Mosnier, M. (1972). 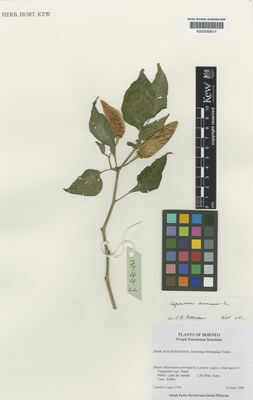 Catalogue des Plantes Vasculaires du Tchad Méridional: 1-289. Institut d' Elevage et de Médecine Vétérinaire des Pays Tropicaux, Maisons Alfort. Hepper, F.N. (ed.) (1963). Flora of West Tropical Africa, ed. 2, 2: 1-544. Guillaumin, A. (1948). Compendium de la Flore Phanérogamique des Nouvelles Hébrides Annales de l'Institut Botanico-Geologique de Marseille, VI, 5-6: 1-56. Fl. Eth. 5: 148 (2006).